Another week, another geopolitical shift is having an impact on the tanker market. This time it's Venezuela's political crisis and a bankrupt state that are causing havoc in tanker trades. In its latest weekly report, shipbroker Gibson said that “on the 23rd of January the US president recognised Venezuela's national assembly speaker Juan Guaido as interim president of the country and called Maduro's government “illegitimate”. Soon afterwards, Washington announced tough sanctions against PDVSA, designed to halt US imports of Venezuelan crude. The government stopped short of placing an outright ban; instead, refiners will be able to continue to receive Venezuela's crude until the 28th of April as long as payments are placed in to a blocked account. Sanctions have already caused chaos and confusion. Reuters reported earlier this week that over a dozen of tankers involved in oil trade with Venezuela were anchored in the US Gulf, as shippers seek clarity and payment instructions”. Gibson said that “according to AIS data, US imports of Venezuelan crude averaged under 0.5 million b/d last year. The biggest buyer was PDV's subsidiary Citgo, followed by Valero, Chevron and PBF. The sanctions come at a time of restricted supply of heavy sour crude and so it may be challenging to replace Venezuela's barrels but not impossible. Similar quality crudes could be sourced from different sources, most likely from Latin America and Canada. There is also a possibility of higher shipments from the Middle East, but that will be subject to OPEC's willingness to increase production. The loss of Venezuela-US crude trade is a negative for regional Aframax and Suezmax demand, although this in part will be mitigated if trade from other Latin American countries rises as a result. Venezuela's long haul crude exports to the East are expected to continue, as most of this trade is backed by “oil for loans” deals with China and Russia. Furthermore, PDVSA plans to divert the volumes effected by sanctions to China, Russia and India, where Rosneft has an equity stake in refining assets. Although this suggests an increase in long haul volumes, there are many uncertainties”. According to the shipbroker, “importing countries will need to find a way to bypass the US financial system. More importantly, it is unclear whether Venezuela will be able to maintain production at current levels, if government access to revenues from US sales is curtailed. Venezuela will also need to source naphtha which it uses to dilute extra heavy grades to make synthetic crude for exports. 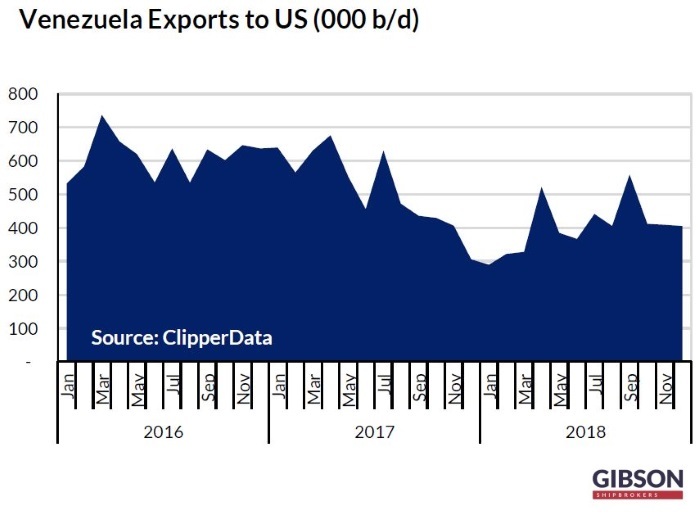 According to ClipperData, Venezuela imported about 80,000 b/d of naphtha from the US last year but these shipments are now prohibited as well. Several cargoes which had been en route from the US to Venezuela when sanctions were announced have been rerouted elsewhere. If Venezuela is unable to find alternative suppliers of diluent, about 250,000 – 300,000 b/d of the country's output could be at risk. The latest sanctions are also expected to halt Venezuela's imports of other clean US products, with shipments averaging around 80,000 b/d in 2018. Here also much depends on whether Venezuela will be able to source barrels from elsewhere. Europe is a good alternative, but most of European countries have voiced their support for Juan Guaido. As such, products are likely to be imported from further afield”. Gibson concluded that “the developments in regional/local politics over the past couple of weeks suggest that Maduro's government is in increasingly challenging position. Venezuela will also find it difficult to secure tanker tonnage for crude and product shipments. The guidance provided by the US Treasury with the regards to the latest round of sanctions somewhat lacks clarity. Shipping is not mentioned; however, owners are considering whether it is worth continuing to trade with Venezuela anyway. The risks are evident and those willing to trade are likely to demand a significant premium”. 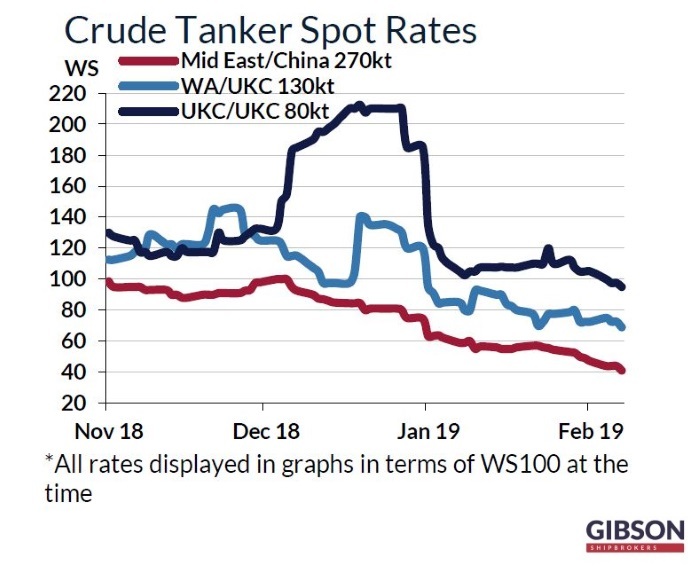 Meanwhile, in the crude tanker market this week, the shipbroker said that “bad just got worse for beleaguered VLCCs, as ongoing weighty availability easily soaked up demand and led rates further downwards to under ws 40 East, even for modern units, and to under ws 19 to the West also. Older vessels had to accept into the very low ws 30's to the East just to stay in the picture. With returns now at close to merely running cost levels there probably won't be much further to fall, but equally a rebound is also hard to call unless Charterers really lose their heads on the March programme. Suezmaxes found only gentle attention to keep rates flatline at no better than ws 80 East and ws 37.5 to the West, with no realistic prospect of early recovery. 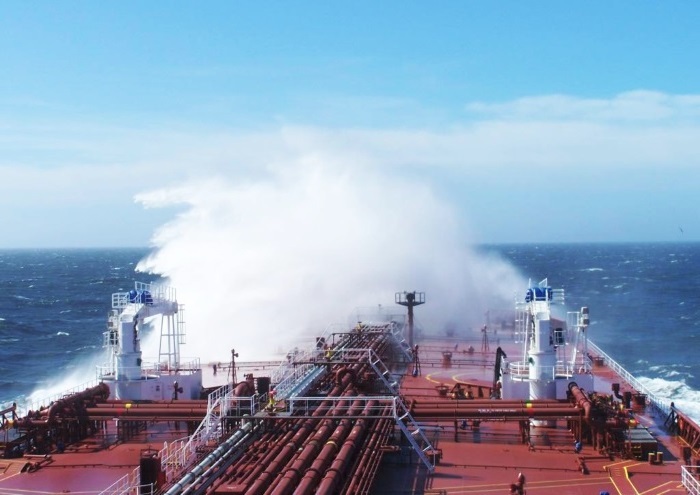 Aframaxes slipped into sub-ws 100 territory to Singapore and need a lot more to happen to prevent further slippage next week”, the shipbroker concluded.